The Walking Dead invades your tree this Christmas! Well, sort of. So these undead zombie ornaments don’t exactly feature characters from the hit TV series and comic book franchise, but no one needs to know. 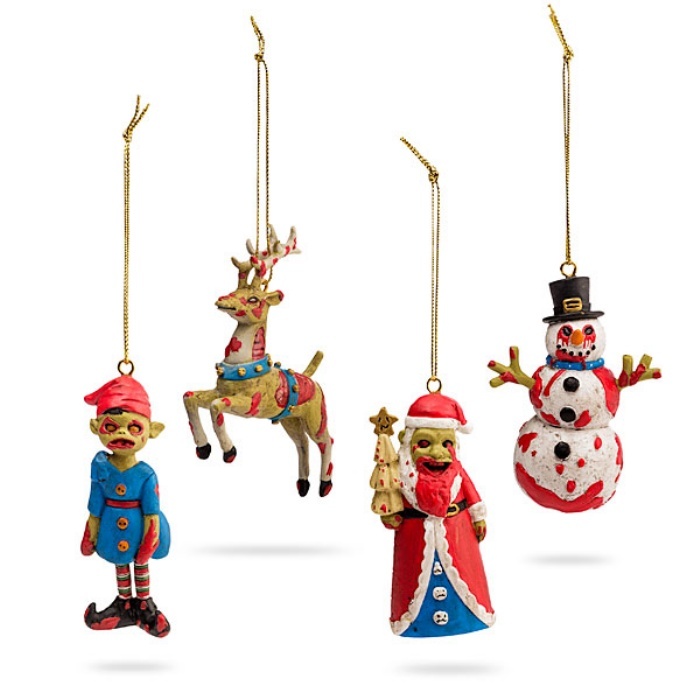 They come in sets of four, with a bloody reindeer and killer snowman accompanying a horrific-looking elf and an undead Santa. By Hazel Chua on 09/26/14 • Leave a comment! Ever since The Walking Dead took the world by storm, people have become pretty obsessed with the undead. Companies have also been scrambling to take advantage of the trend, and Chia is no exception. 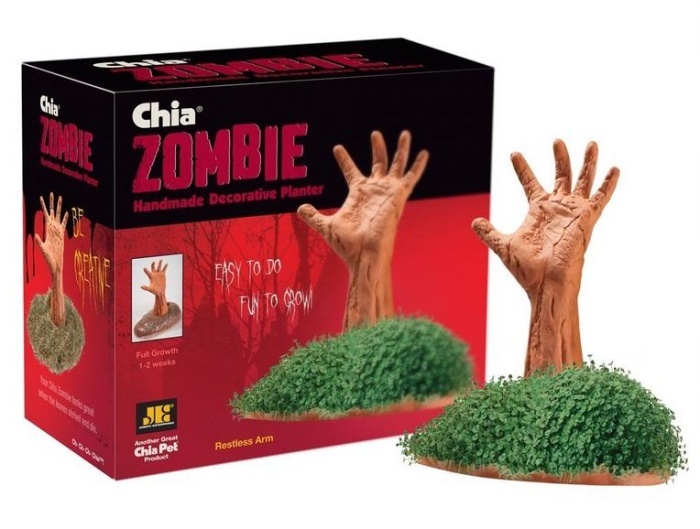 You might be familiar with Joseph Enterprises’ line of Chia Pets, where you basically just water it until the chia grows and covers the planter that it came with. 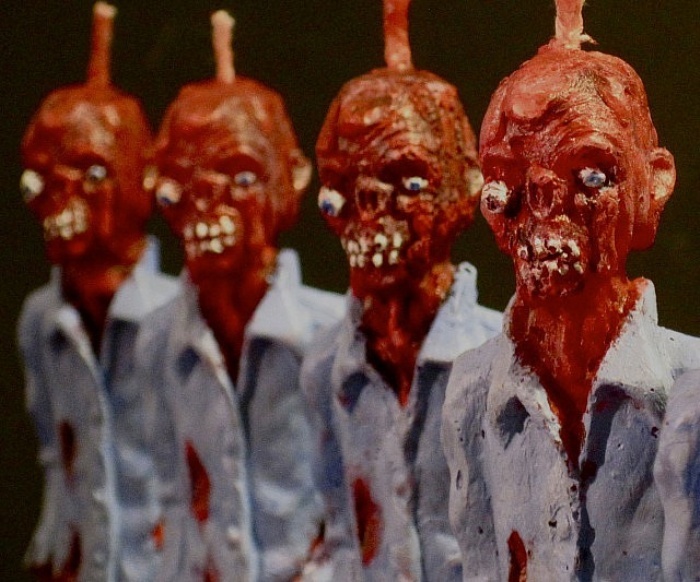 You’ve already seen the kitten or puppy versions– now check out the Zombie-themed ones. There’s the Creepy Holden, which features a zombie head poking out from your (soon-to-grow) garden. Then there’s Lifeless Lisa, his female counterpart, and the Restless Arm which features none other than a, well, restless arm. You can get them from Amazon or Home Depot for $30. By Hazel Chua on 04/04/14 • Leave a comment! Shows like The Walking Dead give a glimpse of the future that could be in the case of a zombie apocalypse. Doesn’t look like a bright future, does it? If you believe the apocalypse is coming, then the first thing you have to do is take measures to make sure that you don’t get bitten. 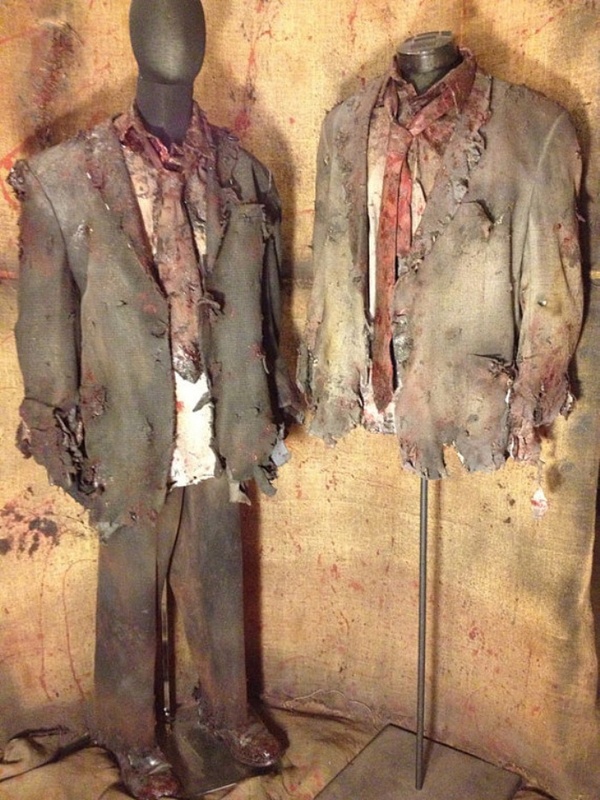 You don’t have to smear yourself with zombie gunk or wear clothes worn by the undead. All you’ll have to do is spritz on Eau De Death and you’ll be fine–in theory, that is. 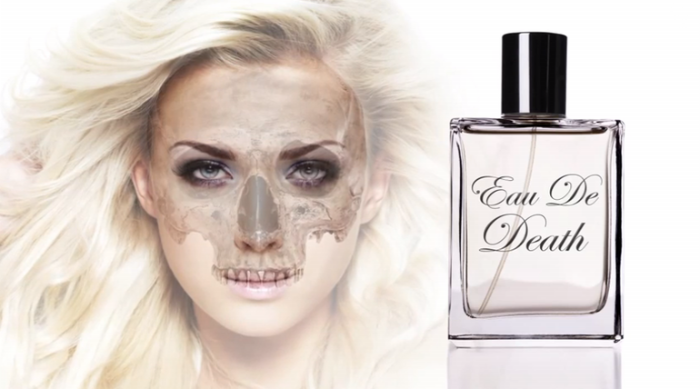 Eau De Death was thought up by chemist Raychelle Burks. It essentially smells like rotting corpses, so this will not only ward of the dead but scare off the living as well. It’s essentially a mix of chemicals that the body naturally produces during decomposition: putrescine and cadaverine. A few drops of methanethiol are added into the mix to give it that nice rotting egg scent. 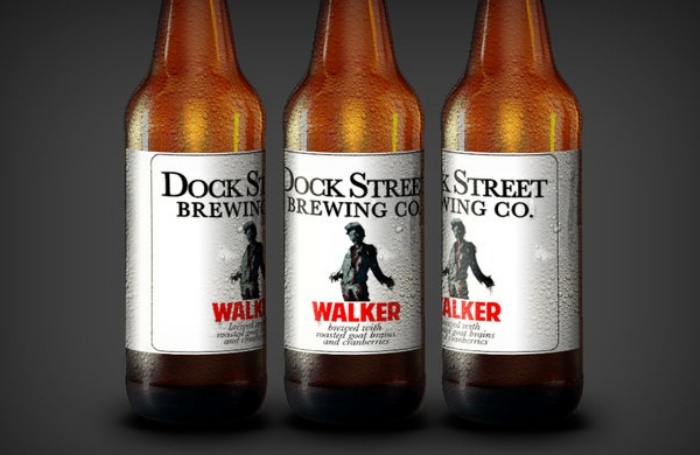 As much as I love the Walking Dead and everything else inspired and associated with it, I’m not too keen on Dock Street Brewing’s Walker beer. It’s an American pale stout that was made in honor of the show’s season finale, and in keeping with the comic book-turned-television show’s theme, it’s brewed with smoked goat brains. Dock Street Walker gets its blood red hue thanks to organic cranberries and not the brains, so that should set your mind at ease–even just a little bit. The beer is 7.2% alcohol by volume and will be released at Dock Street Brewing Co. on March 30. You might want to drop by if you happen to be in the area. By Hazel Chua on 02/17/14 • Leave a comment! If you believe that the zombie apocalypse is coming, then it’s time to save up for the Wolfram Cabinet aka the Zombie Apocalypse survival cabinet that is filled to brim with everything you need to survive. 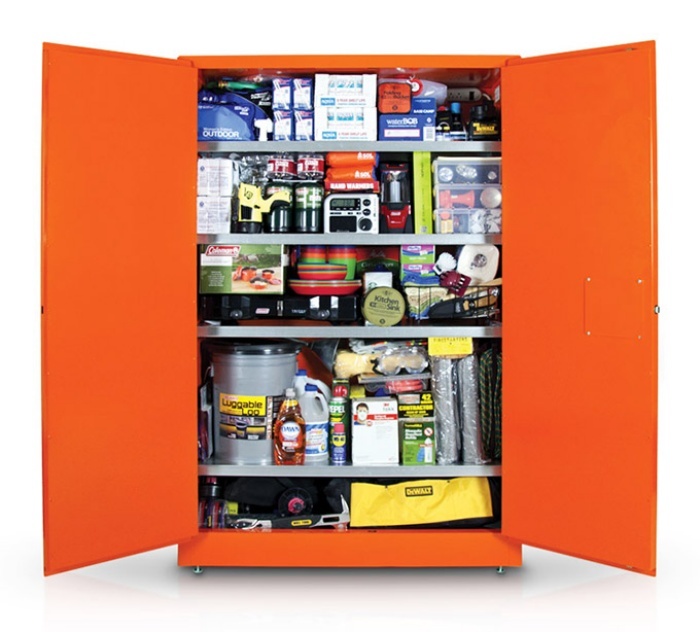 The steel-walled cabinet measures 43″ (W) x 65″ (H) x 18″ (D) and comes stocked with 170 items that includes tools, cooking utensils, camping supplies, water, food, and emergency supplies, among others. By Hazel Chua on 06/14/13 • Leave a comment! 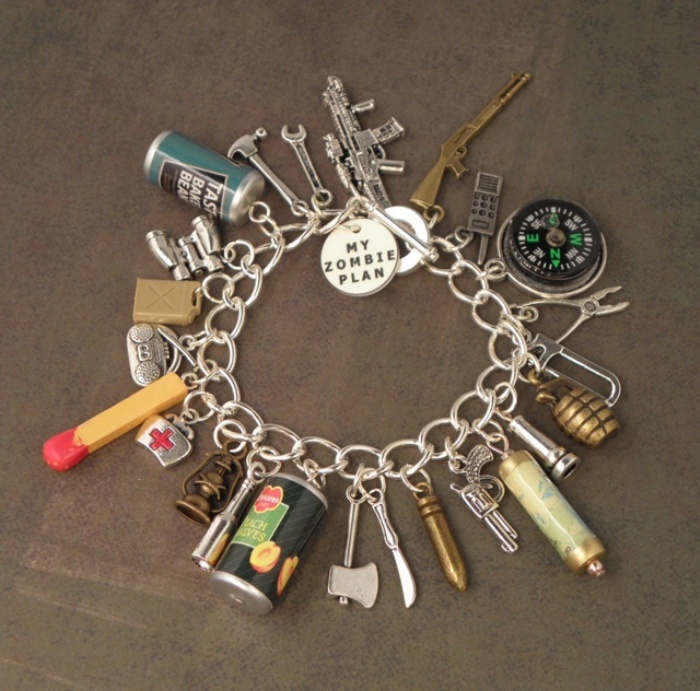 You’ll need to have a well-rounded mix of skills in order to survive a zombie apocalypse, and this charm bracelet contains most, if not all, of the things you’d need aside from those skills. The bracelet is loaded with charms ranging from weapons and tools to food items and communication devices. I’m pretty sure even Michonne would approve. The “I’ve Got a Zombie Plan” charm bracelet is available for pre-order from PlayBox’s shop on Etsy. It’s priced at $32.23. Rice Krispy Treats Zombie Wants You to.. Eat Its Jello Brains? By Hazel Chua on 03/27/13 • Leave a comment! Do zombies have brains? I used to think that they didn’t, considering the fact that they move like unthinking beings. At least, that’s what they do on The Walking Dead anyway. Note that I said I ‘used to’, because if this edible bust of a zombie is to be believed, then it means that the undead are walking around with a brain in their not-so-thick-skulls–a brain made of Jello. 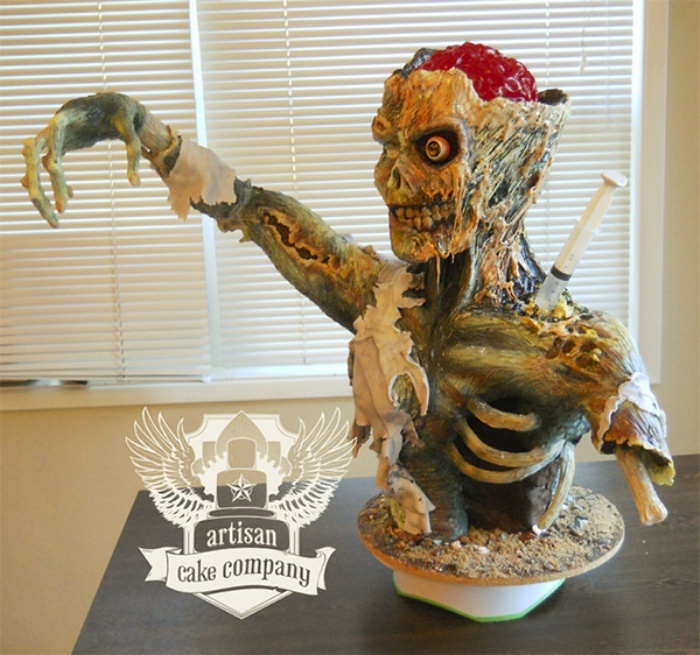 Obviously, I only mean this extremely awesome-but-gruesome zombie cake that was made by the Artisan Cake Company using Rice Krispy Treats, fondant, petal dust, and a whole lot of food coloring.